When you pin 15 aspiring chefs against one another in a television cooking competition and leave their fate up to the harshly critical celebrity chef Gordon Ramsay, you get ‘Hell’s Kitchen’, Fox’s hit reality show. In the show, Ramsay eliminates contestants based on their performance in the kitchen until one cook is left standing. The winner is awarded the opportunity to work in a high-end restaurant as head chef. 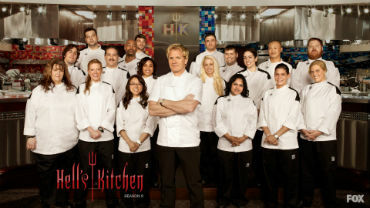 ‘Hell’s Kitchen’ made its series debut back in 2005 and is now in its tenth season, which can be watched Mondays at 8 pm EST on Fox, or online for free, using FreeCast. We have full new episodes of ‘Hell’s Kitchen’ and several other hit shows available for free online the very next day after they premiere on television. There’s no longer any need to rush home just to watch your favorite shows when they first appear on the air, since you can now find them online, completely free. Watch online episodes of ‘Hell’s Kitchen’ and just about every other TV show whenever you feel like it. Don’t have a computer to watch your shows on? Use your mobile device to pull up free online episodes of ‘Hell’s Kitchen’ wherever you are. It’s always prime time at FreeCast, so what are you waiting for? Start watching TV online now!